It is estimated that nearly 44 metric tons of meteoric material enter the Earth�s atmosphere daily [Hughes, 1975; Millman, 1975]. Approximately ~70% of the incident meteoroids are vaporized due to heating during atmospheric entry at altitudes between 80 and 100 km. Meteorites are the surviving portion of a meteoroid, and micrometeorites are particles that are too small to reach their boiling point. Meteoric materials are oxidized by collision with atmospheric O2, and vapor resulting from meteoroid ablation condenses to form �smoke� particles in the mesosphere [e.g., Rosinski and Snow, 1961; Hunten et al., 1980]. The composition of incident meteoroids is similar to carbonaceous chondrites containing an abundance of volatile elements including silicon, magnesium, and iron. While the incident mass of cosmic material is primarily from meteoroids with radii between 50 and 500 mm [Millman, 1975], the suspended atmospheric mass exists primarily as smoke particles with radii between 0.2 and 10 nm [Hunten et al., 1980]. This work explores the detection of cosmic smoke and dust at mesospheric altitudes using solar occultation at infrared wavelengths. While the exact composition of smoke particles is unknown, they are thought to contain a variety of compounds including carbon, sulfur, silicon, magnesium, and iron. Suggested smoke particle compositions include oxides of the volatile compounds (e.g., FeO and SiO2). Optical constants have been measured for a variety of smoke analogues [e.g., Jager et al., 1998; Henning and Mutschke, 1997] and the Astrophysical Institute at the Friedrich-Schiller-Universität, Jena has compiled an extensive record of optical constants for a variety of particles composed of silicates, oxides and sulfides, and carbon. Examples of these data are given in Figure 1. Figure 1. The real and imaginary refractive indices for ice, and a variety of cosmic smoke analogues. Complete size distributions of smoke and dust in the atmosphere have not been measured, nor has the distribution of these particles in altitude. Thus, the current understanding of these particles is derived from scant observations combined with theory. Hunten et al. offered model calculations of height dependent smoke and dust size distributions, based on the incident meteoric mass flux, velocity distribution, ablation, and recombination of ablation products. Rapp et al. have recently modeled the vertical profile of smoke particle size distribution using the Community Aerosol and Radiation Model for Atmospheres (CARMA). That work used the influx of meteoric material from Kalashnikova et al. , and assumed that all incoming material ablates to form particles with initial radii of 0.25 nm. These particles coagulate to form larger particles, and their distribution in height is determined by the vertical wind [Koerner and Sonnemann, 2001] and eddy diffusion [Luebken, 1997]. The volume of smoke versus altitude from the CARMA model is shown in Figure 2a. 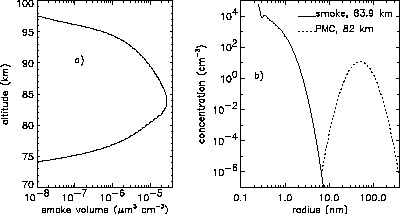 The greatest abundance of cosmic particles occurs near 84 km altitude, and the particle size distribution at this height is shown in Figure 2b. By comparison, volume densities in typical polar mesospheric clouds (PMCs) are roughly 0.1 mm3 cm-3, and PMC particles are roughly 100 times larger than smoke, although smoke particles are more numerous (Figure 2b). Figure 2. a) The volume of cosmic smoke versus altitude from model calculations. b) The smoke size distribution at 83.9 km. A typical PMC size distribution is shown for comparison. The PMC volume density for this distribution was 0.08 mm3 cm-3. Because the smoke layer is tenuous, the best approaches for remote detection will likely involve scattering and/or absorption of radiation from a strong source. Two measurement approaches within this category are lidar and solar occultation. Here we consider smoke detection using solar occultation at infrared wavelengths. Advantages for this approach become evident below. The Solar Occultation for Ice (SOFIE) instrument has been proposed for making infrared measurements of aerosols and gasses at mesospheric altitudes. 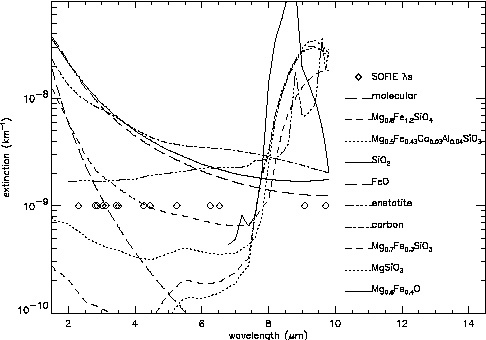 The 8 SOFIE wavelengths (2.3 to 10 mm) were considered in smoke signal simulations. Smoke particles will attenuate incident solar radiation through scattering and absorption (extinction). Smoke extinction spectra were modeled based on the particle refractive indices and size distributions discussed above. Assuming spherical particles, the extinction cross sections of individual particles were calculated using Mie theory. Extinction coefficients b(l) were then determined by integrating the single particle cross sections over an appropriate size distribution. Calculated smoke extinction spectra considering a model smoke size distribution and a variety of particle compositions are shown in Figure 3. Figure 3. Extinction versus wavelength calculated using the model smoke size distribution at 83.9 km (Figure 2) and refractive indices for a variety of particle types. Also shown is the molecular extinction calculated for 160 K temperature and 0.004 mb pressure. SOFIE channel locations are indicated. Biermann, U. M., T. Presper, T. Koop, J. MoBinger, P. J. Crutzen, Th. Peter, The unsuitability of meteoric and other nuclei for polar stratospheric cloud freezing, Geophys. Res. Letters, 23, 1693-1696, 1996. Henning, Th., B. Begemann, H. Mutschke, J. Dorschner, Optical Properties of Oxide Dust Grains, Astron. Astrophys. Suppl. Ser., 112, 143-149, 1995. Henning, Th., and H. Mutschke, Low-temperature infrared properties of cosmic dust analogues, Astron. Astrophys., 327, 743, 1997. Hunten, M. D., R. P. Turco, O. 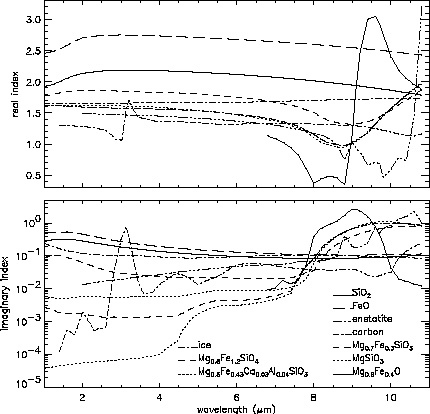 B. Toon, Smoke and Dust particles of meteoric origin in the mesosphere and stratosphere, J. Atmos. Sci., 37, 1342-1357, 1980. Jäger, C., H. Mutschke, J. Dorschner, and Th. Henning, Optical properties of carbonaceous dust analogues, Astron. Astrophys., 332, 291, 1998. Kalashnikova, O., M. Horanyi, M., G. E. Thomas, O. B. Toon, Meteoric smoke production in the atmosphere, Geophys. Res. Lett., 27, 3293-3296, 2000. Korner, U., and G. R. Sonnemann, Global three-dimensional modeling of the water vapor concentration of the mesosphere-mesopause region and implications with respect to the noctilucent cloud region, J. Geophys. Res., 106, 9639-9652, 2001. Lübken, F.-J., Seasonal variation of turbulent energy dissipation rates at high latitudes as determined by in situ measurements of neutral density fluctuations, J. Geophys. Res., 102 , p13,441, 1997. Mutschke, H., B. Begemann, J. Dorschner, C. Jäger, and Th. Henning, Optical data of glassy pyroxenes and olivines, The Cosmic Dust Connection, ed. J. M. Greenberg, Kluwer, Dordrecht, p223, 1996. Rapp M., F.-J. Luebken, A. Muellemann, G. E. Thomas, and E. Jensen, Small scale temperature variations in the vicinity of NLC: Experimental and model results, J. Geophys. Res., in review, 2001.